In a year primarily dominated by interest in in-solar system exploration, 2013 saw significant and substantial discoveries of planets outside our solar system. Through our fleet of space- and ground-based observatories, scientists experienced both elation and bewilderment as 31 new exoplanets entered the realm of study in 2013. They are the long-romanced wonders of the galaxy outside our solar system. Exoplanets were, until 1992, the stuff of science-fiction and unconfirmed theories. First proposed in the 16th century by Italian philosopher Giordano Bruno, exoplanets were suggested as part of growing claims and evidence for the Copernican theory of solar system composition. The theory stated that the sun was the center of the solar system and that the sun in fact bound Earth and the other then-known planets of the solar system. In Bruno’s theory, he put forth the idea that planets likewise accompanied the other observable stars similar to the sun. He was burned at the stake by the Roman Inquisition in 1600 for his views, of which his views on astronomy were not the main reason for his condemnation. For 400 years, exoplanets continued their theoretical existence in the realm of science. Over the course of those 400 years, several discredited or later retracted claims put forth that assertion that exoplanets had been detected. But it was not until 1992 that the first two exoplanets were concretely discovered and confirmed. The first two exoplanets known to humans were announced on 22 April 1992 when a team of radio astronomers announced their presence around pulsar PSR 1257+12. The confirmed discover superseded the 1988 hesitant and problematic announcement of an exoplanet orbiting Gamma Cephei. The highly questioned existence of this exoplanet was not confirmed until 15 years later, thus making the 1992 pulsar planets announced the generally accepted first exoplanets to be found and confirmed. The first multi-planet extra-solar system was confirmed in 1999 when Upsilon Andromedae was found to have more than one planet in orbit. But until 2009, most known exoplanets were massive super-Jupiters with relatively short orbital periods. It wasn’t until major technological advancements in ground-based telescopes and the launch of NASA’s Kepler Space Telescope in 2009 that the exoplanet tally and size-range exploded. In the short intervening four years since 2009, an unprecented number of exoplanets have been found and confirmed and an even larger number of candidate exoplanets identified. In 2013 alone, 31 additional exoplanets were either confirmed or entered as candidates into the exoplanet catalog. With these additions, the total number of confirmed exoplanets as of 28 December 2013 stands at 1,056 planets in 802 planetary systems, 175 of those being multiple-planet systems. In addition to the confirmed number, there remains 3,568 candidate exoplanets from the Kepler Space Telescope mission alone, of which only about 11% (392.4) are likely to be false positives. In 2013, the estimated number of total planets within the Milky Way galaxy went unchanged from the initial 2012 estimate of 100 billion; however, the number of possible rogue planets skyrocketed into the trillions. Furthermore, new estimations revealed that 1-in-5 Sun-like stars have an Earth-sized planet in their habitable zones, meaning that, statistically, the nearest Earth-sized planet would be expected within 12 ly distance of the solar system. While yet to be confirmed, the nearest known candidate exoplanet to Earth is Alpha Centauri Bb approximately 4.3 ly from Earth. And while all of the currently confirmed or candidate exoplanets reside within the Milky Way, there are a small number of possible planetary detections from galaxies other than the Milky Way, which if confirmed would make them the first extragalactic planets to be discovered. Among the host of alien worlds discovered this year were two planets that challenge and lend insight to current planetary formation theories. The first of these is planet HD 106906 b, a planetary-mass companion and candidate exoplanet orbiting the star HD 106906 in the constellation Crux. Located approximately 300 ly from Earth, this planet is estimated to be about 11 times the mass of Jupiter and orbits its primary (star) at a whopping 650 AU or nearly 97 billion km away from the primary. 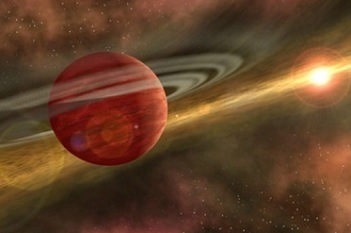 The planet was quickly identified as being unique in the realm of exoplanets because while its mass estimate is consistent with previously observed super-Jupiters, the planet appears at a much wider separation from its primary then previously thought possible for in-situ formation from a protoplanetary disk. 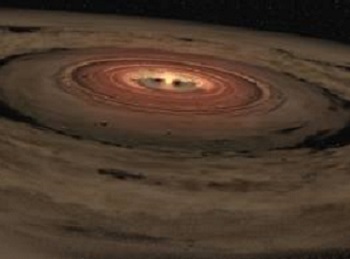 In short, current protoplanetary disk formation theories do not explain the existence of HD 106906 b. Several theories for the existence of HD 106906 b have been presented, including: 1) its orbit might actually be highly eccentric and intersect the outer edge of the protoplanetary formation desk at periapsis (time of closest approach to the primary of an exoplanet in its orbit – like perihelion for solar system planets); 2) it might be a failed companion star; 3) it may have formed within the protoplanetary disk and been scattered to its current location by gravitational interaction with another object; and 4) it is a captured planet that formed elsewhere. Formation theories two and three are highly problematic given that 1) the mass ratio of approximately 142:1 between the primary and the planet greatly exceeds the normal binary star formation ratio of 10:1 and 2) that gravitational interaction with another body would mean that the other body is more massive than HD 106906 b (something that no evidence has been found to corroborate) and that the gravitational interaction process would have significantly scattered the protoplanetary disc in the process of flinging HD 106906 b to its current location. Another theory also suggests that HD 106906 b might not be gravitationally bound to the star and is in fact a distinct object that just happens to be located along our line of sight and, by chance, moving in the same direction as the star. The odds of such a coincidence are less than 0.01 percent. Nonetheless, discovery of this planetary-mass companion has led to fascinating public interest in the planet – specifically: what the planet should be named. Prior to August 2013, the International Astronomical Union’s (IAU’s) stance was that it would not name exoplanets, deeming the process impractical. However, in August 2013, the IAU reversed its stance and invited members of the public to suggest names for exoplanets. 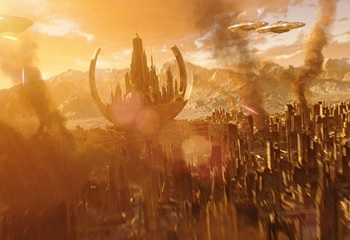 This decision led to an interesting December campaign when nearly 133,000 signatures were collected as part of an effort to name the exoplanet candidate Gallifrey after the home world of The Doctor in the British science-fiction television series Doctor Who. The IAU has thus far not commented on the campaign. 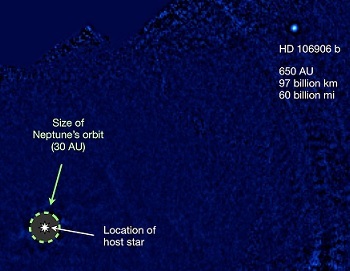 But HD 106906 b was not the only long-distance orbiting exoplanet discovered this year. Combining 2012 and 2013 data from the Herschel Space Observatory, scientists were able to confirm the existence of HD 95086 b, a super-Jupiter planet orbiting its parent star at a distance of 56 AU. For reference, the farthest major planet in the solar system, Neptune, orbits at an average distance of 30.1 AU. HD 95086 b is massive (five times the mass of Jupiter) and exists in a large orbital radius, thus making it a viable candidate for a planet that formed close to its host star and was then scattered outward via gravitational interactions with other massive particles in orbit around the parent star. This scattering is of interest to scientists as the Nice Model of our solar system formation suggests that the Gas Giants originally formed in orbits no farther than 17 AU from the sun, and that gravitational interactions eventually flung Uranus and Neptune out into the scattered disc at a distance of approximate 35 AU. As Uranus and Neptune scattered into the remaining planetesimal disc at approximately 600 million years into the formation of the solar system, their scattering: 1) disrupted the primordial planetary formation disc, flinging some objects into the inner solar system (the Late Heavy Bombardment); 2) prevented the accretion of dense trans-Neptunian objects; 3) and then finally caused the two planets to switch places in order from the sun (a theory which puts forth that Neptune was originally the seventh planet from the sun, not the eighth as it is now). To this end, explanet HD 95086 b is of considerable interest to scientists because of its potential scattered origin and also for the fact that it exists in a very young planetary system (only 17 million years old) in astronomical terms – giving scientists the ability to witness planetary formation while it is likely still happening. Joining the pantheon of exciting exoplanet discoveries in 2013 was the unexpected confirmation of the long-theorized but not-quite-proven-in-2012 existence of rogue planets. By definition, a rogue planet is a planetary-mass object that orbits the galaxy directly and has either been ejected from the planetary system in which it formed or was never gravitationally bound to any star or brown dwarf. Last year, scientists came the closest they ever had to finding a rogue planet in the free-floating planetary-mass object known as CFBDSIR 2149-0403. 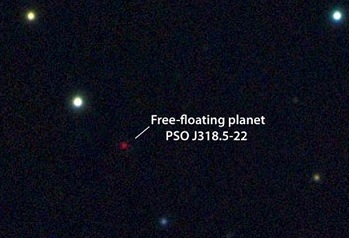 The object from 2012 carried an 87% chance of being a free-floating planetary-mass object and a 13% chance of being a low mass brown dwarf; however, confirmation of its status as a free-floating planetary-mass object, or rogue planet, could not be demonstrated conclusively. Enter PSO J318.5–22, a confirmed extrasolar object of low mass and radius that is completely free of a host star. The rogue planet was discovered using data gathered by the Pan-STARRS wide-field telescope by a team of researchers from the Institute for Astronomy at the University of Hawaii. The rogue planet is 80 ly from Earth and has a mass of 6.5 times that of Jupiter and a radius of 1.53 that of Jupiter. 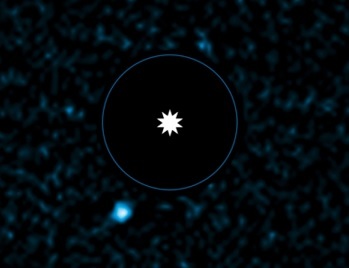 With an approximate age of 12 million years, the rogue planet is part of the Beta Pectoris moving group and is the first such rogue planet to be confirmed via direct observation. Ground-based telescopes weren’t the only tools used to make striking discoveries about exoplanets this year. Following its use to discover the planet HD 189733b in 2005, the Hubble Space Telescope was used this year to study the planet’s atmosphere in detail. The results were striking: an atmosphere that appears blue in color because of high clouds laced with silicate particles, daytime temperatures of 2,000 degrees F, and the possibility of liquid glass rain amid 4,500 mph winds. The discovery from Hubble marked the first time that an exoplanet’s apparent color was determined. Following closely on this announcement came a NASA release that Hubble and the Spitzer Space Telescopes had been used to produce the first-ever cloud map of a exoplanet. The planet in question, Kepler-7b, was the confirmed within the first 35 days of Kepler’s mission in 2009. Due to its size and short orbital period (5 days), the planet received attention from the two venerable NASA telescopes. 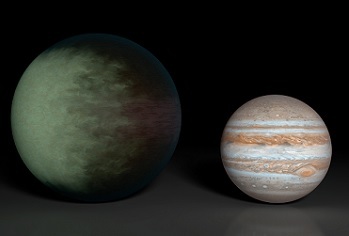 “By observing this planet with Spitzer and Kepler for more than three years, we were able to produce a very low-resolution ‘map’ of this giant, gaseous planet,” said Brice-Olivier Demory of Massachusetts Institute of Technology in Cambridge. The planet is marked by high clouds in the west and clear skies in the east. Previous studies from Spitzer have resulted in temperature maps of planets orbiting other stars, but this is the first look at cloud structures on a distant world. In addition to challenging current gas giant planet creation theories and the confirmation of rogue planets, 2013 was also a very significant year in terms of terrestrial exoplanet discoveries. 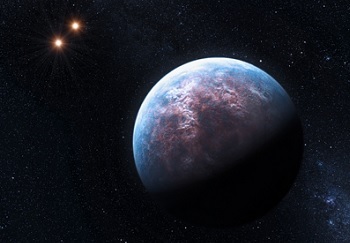 To this end, the Gliese 667 C system shines as a system thrown into an unprecedented category in 2013: a system with three habitable zone terrestrial planets around a single star. The first of these super-Earth planets to be discovered this year was Gliese 667 Ce. The planet orbits its parent star every 67.26 days at a distance of 0.212 AU (very close to the outer boundary of the habitable zone) and was discovered using the radial velocity measurement of detection – a detection method which studies the gravitational tug of the planet’s gravity and corresponding wobble on its host star during an orbit. 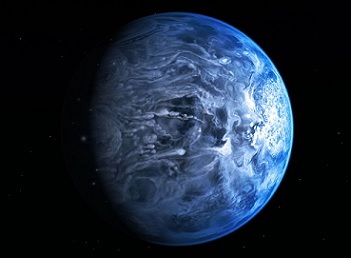 While the stellar flux of the planet (measurement of the total power of electromagnetic radiation – including infrared, ultraviolet, and visible light) is about a third of that of Earth’s, it is possible that this exoplanet possesses liquid water on its surface if enough greenhouse gases are present within the exoplanet’s atmosphere. Likewise, scientists also discovered Gliese 667 Cf, the fourth planet from the star but the fifth discovered planet in the Gliese 667 C system. This is because exoplanet are named in the order of their discovery, not in their order from the star they orbit. For exoplanet naming conventions, capital letter designations are never as capital letters are reserved for stars when more than one star exists in the same system. 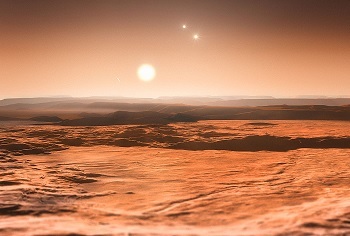 For the Gliese 667 system, this is seen in the naming of the three stars as 667 A, 667 B, and 667 C.
For exoplanets, the lowercase “a” designation is never used for the first-discovered exoplanet in a system to avoid confusion with the “a” designation sometimes given to a binary pair closely orbiting each other. For example, Alpha Centauri A and B are a closely orbiting binary pair that could accurately be labeled as Alpha Centauri Aa and Ab – with Aa being the brightest of the pair. 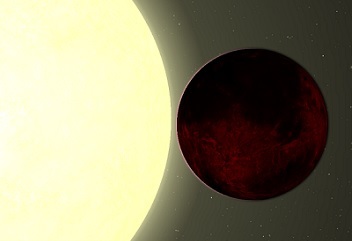 Therefore, when an exoplanet is discovered, it receives its name by taking the primary star’s designation and adding a lowercase letter, starting with “b” for the first discovered exoplanet in a system and then proceeding through the lowercase alphabet in the order of discovery, not the order of the planets from their parent star. For context, Gliese 667 is the system name for the three stars of the trinary group. Gliese 667 C is the second-brightest companion of the Gliese 667 A primary (brightest) star of the group. When planets were discovered around Gliese 667 C, they took the parent name of the start “Gliese 667 C” with an added lowercase letter (“b”) added to that. Therefore, the order of the planets in the Gliese 667 C system is not uniform with the alphabet. 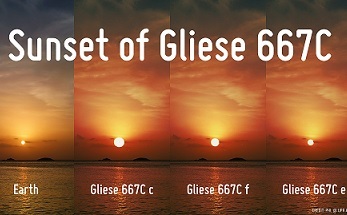 In Gliese 667 C’s case, the order of its planets (in increasing orbital distance) is: Gliese 667 Cb, Ch, Cc, Cf, Ce, Cd, and Cg. Thus, the planets discussed here are the planets of the Gliese 667 C star, not the combined planets of the trinary group. 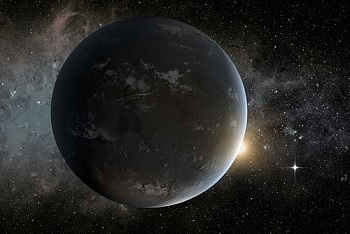 Back to exoplanet Gliese 667 Cf, the exoplanet poses significant interest not just for the fact that it orbits within the habitable zone of its parent star, but because it orbits dead center within the habitable zone of its parent at a distance of 0.155 AU. The planet’s orbital period is 39.08 days, and it is approximately 1.94 Earth masses. The planet receives approximately 60% starlight compared to Earth but receives far more infrared radiation than Earth because of the characteristics of its host red dwarf star as compared to Earth’s G-typed main sequence host star. 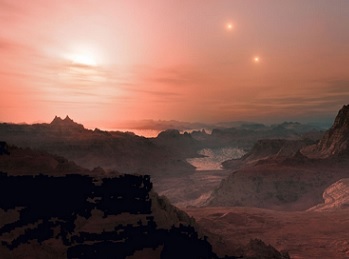 With the discovery of planets Ce and Cf coupled to the 2012 discovery of the Cc planet, the Gliese 667 C system stands in the unusual category of having three terrestrial planets orbiting within the habitable zone of the parent star. Not even our own solar system boasts those numbers as only Earth orbits within the conservatively defined habitable zone around the sun and only Earth and Mars orbit within the optimistically defined habitable zone of our sun. 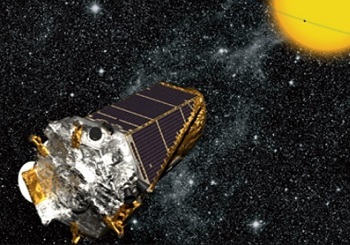 As with the previous year, the bulk of exoplanet discoveries/confirmations in 2013 came from systems first observed and named after the Kepler Space Telescope. Discoveries from the telescope this year included Kepler-37b, the smallest planet ever discovered around a main sequence star. 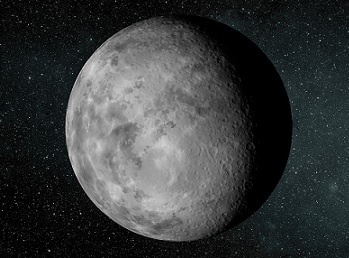 Kepler-37b has a mass and radius only slightly greater than those of Earth’s moon. In the same Kepler-37 system, Kepler also discovered the Kepler-37c planet – which is only slightly smaller than Venus. This year, Kepler was also responsible for the discovery of the Kepler-61b planet, a terrestrial planet with a radius of two Earths that is located in the inner part of its host star’s habitable zone. For comparison, Earth orbits the sun at the inner part of the sun’s habitable zone. Most exciting in terms of observations from Kepler this year came in the form of the announcement of the discoveries of Kepler-62e and -62f, two super-Earth exoplanets around the star Kepler-62. Located approximately 1,200 ly from Earth in the constellation Lyra, the exoplanets were found using the transit method of detection, orbit their host star in the inner and outer parts of the star’s habitable zone, respectively, and have an Earth Similarity Index of 0.83 and 0.69, respectively – where “1” is Earth. Research and data from Kepler estimates a planetary age of 7 billion years for Kepler-62e and -62f and a likely rocky composition for both worlds. Likewise, a substantial amount of surface water is also considered plausible for Kepler-62e. Modeling for -62e further suggests that it is likely that a great majority of planets within its size range are completely covered by ocean. Moreover, Kepler also returned confirmation of the most Earth-like planet in terms of mass, radius, and mean density in 2013. Known as Kepler-78b, the exoplanet orbits extremely close to its host star with an orbital period of just 8.5 hours and an orbital distance of 0.01 AU. The world itself is not habitable, but its mass is estimated to be 1.69-1.85 that of Earth, its radius 1.12 that of Earth, and its density 5.3-5.6 grams per cubic centimeter – the equivalent to that of Earth. These findings suggest that Kepler-78b is possibly composed of a rock-iron composition. 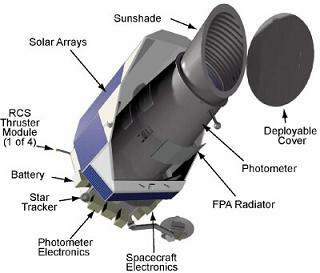 Sadly, 2013 saw the end of primary science operations for the Kepler Space Telescope. With the May failure of the second of four reaction wheels used to point the spacecraft, the telescope was formally taken out of active service from its primary planet-hunting mission. By August, NASA announced that all attempts to retrieve the failed reaction wheels would cease and that the current mission of Kepler would be modified. 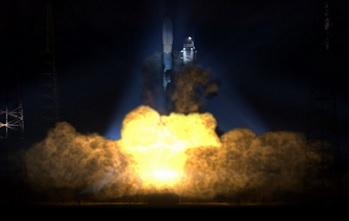 After input from the community, a potential K2 “Second Light” mission had been submitted for consideration by November, with the goal of this mission to survey and detect habitable planets around small, dimmer red dwarf stars, survey Earth’s orbit for asteroids, and study supernova, star formation, and comets. Despite its removal from planet-hunting duty, Kepler has returned a significant amount of data and operated beyond its initial 3.5-year life expectancy. By the end of its primary mission phase this year, Kepler had found 134 confirmed exoplanets in 76 systems and 3,568 unconfirmed exoplanet candidates. In this way, Kepler has helped us understand that on average every single star within our galaxy has at least one planet orbiting it and that most stars indeed have more than one planet orbiting them. And while its primary mission is over, the yet to be confirmed 3,568 exoplanet candidates from Kepler will keep scientists busy for the years to come. (Images via NASA, JPL, and the BBC).